The quotes below express eloquently why we at ROW are so passionate about the rivers we raft. 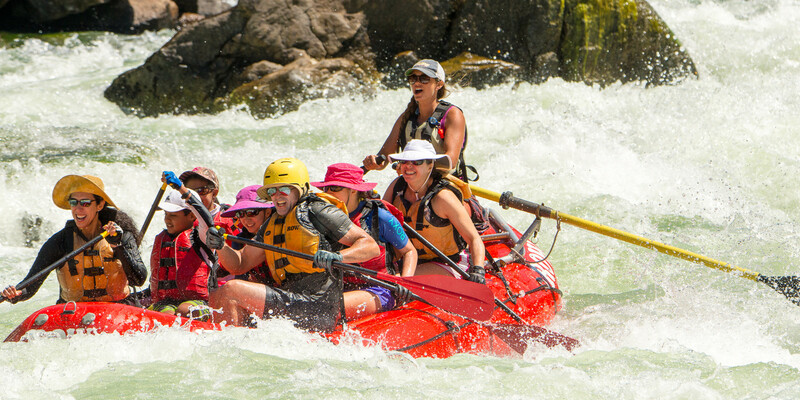 We can only imagine many of these quotes came directly from our favorite rivers like the Futaleufu River, Lower Salmon River, the Snake River and the Middle Fork of the Salmon. Enjoy! The care of rivers is not a question of rivers, but of the human heart. We labor long and earnestly for peace, because war threatens the survival of man. It is time we labored with equal passion to defend our environment. A polluted stream can be as lethal as a bullet. I see an America whose rivers and valleys and lakes hills and streams and plains the mountains over our land and nature's wealth deep under the earth are protected as the rightful heritage of all the people. The good life on any river may...depend on the perception of its music, and the preservation of some music to perceive. Rivers have what man most respects and longs for in his own life and thoughta capacity for renewal and replenishment, continual energy, creativity, cleansing. ... the time has also come to identify and preserve freeflowing stretches of our great rivers before growth and development make the beauty of the unspoiled waterway a memory. A river is more than an amenity.... It is a treasure. It offers a necessity of life that must be rationed among those who have power over it. Better than oceans, for we see both sides. I wish to make it clear to you, there is not sufficient water to irrigate all the lands which could be irrigated, and only a small portion can be irrigated....I tell you, gentlemen, you are piling up a heritage of conflict! For many of us, water simply flows from a faucet, and we think little about it beyond this point of contact. We have lost a sense of respect for the wild river, for the complex workings of a wetland, for the intricate web of life that water supports. We have been quick to assume rights to use water but slow to recognize obligations to preserve and protect it... In short, we need a water ethica guide to right conduct in the face of complex decisions about natural systems we do not and cannot fully understand. Streams represent constant rebirth. The water flows in, forever new, yet forever the same; they complete a journey from beginning to end, and then they embark on the journey again. The river is the center of the land, the place where the waters, and much more, come together. Here is the home of wildlife, the route of explorers, and recreation paradise. . . . Only fragments of our inheritance remain unexploited, but these streams are more valuable than ever. The river moves from land to water to land, in and out of organisms, reminding us what native peoples have never forgotten: that you cannot separate the land from the water, or the people from the land. and the talk of the watercourses everywhere in the hollows! Nobody started it, nobody is going to stop it. It will talk as long as it wants this rain. As long as it talks I am going to listen. To trace the history of a river or a raindrop...is also to trace the history of the soul, the history of the mind descending and arising in the body. In both, we constantly seek and stumble upon divinity, which like feeding the lake, and the spring becoming a waterfall, feeds, spills, falls, and feeds itself all over again. I have never seen a river that I could not love. Moving water...has a fascinating vitality. It has power and grace and associations. It has a thousand colors and a thousand shapes, yet it follows laws so definite that the tiniest streamlet is an exact replica of a great river. I started out thinking of America as highways and state lines. As I got to know it better, I began to think of it as rivers. Eventually, all things merge into one, and a river runs through it. The river was cut by the world's great flood and runs over from the basement of time. On some of the rocks are timeless raindrops under the rocks are the words and some of the words are theirs. A river sings a holy song conveying the mysterious truth that we are a river, and if we are ignorant of this natural law, we are lost. Can we afford clean water? Can we afford rivers and lakes and streams and oceans which continue to make possible life on this planet? Can we afford life itself? Those questions were never asked as we destroyed the waters of our nation, and they deserve no answers as we finally move to restore and renew them. These questions answer themselves. Our planet is beset with a cancer which threatens our very existence and which will not respond to the kind of treatment that has been prescribed in the past. The cancer of water pollution was engendered by our abuse of our lakes, streams, rivers, and oceans; it has thrived on our halfhearted attempts to control it; and like any other disease, it can kill us. We have ignored this cancer for so long that the romance of environmental concern is already fading in the shadow of the grim realities of lakes, rivers and bays where all forms of life have been smothered by untreated wastes, and oceans which no longer provide us with food. Rivers are magnets for the imagination, for conscious pondering and subconscious dreams, thrills and fears. People stare into the moving water, captivated, as they are when gazing into a fire. What is it that draws and holds us? The rivers' reflections of our lives and experiences are endless. The water calls up our own ambitions of flowing with ease, of navigating the unknown. Streams represent constant rebirth. The waters flow in, forever new, yet forever the same; they complete a journey from beginning to end, and then they embark on the journey again. When we save a river, we save a major part of an ecosystem, and we save ourselves as well because of our dependencephysical, economic, spiritual,on the water and its community of life. I gave my heart to the mountains the minute I stood beside this river with its spray in my face and watched it thunder into foam, smooth to green glass over sunken rocks, shatter to foam again. I was fascinated by how it sped by and yet was always there; its roar shook both the earth and me. To the lost man, to the pioneer penetrating a new country, to the naturalist who wishes to see the wild land at its wildest, the advice is always the same follow a river. The river is the original forest highway. It is nature's own Wilderness Road. I chatter, chatter as I flow to join the brimming river, for men may come and men may go, but I go on forever. Rivers must have been the guides which conducted the footsteps of the first travelers. They are the constant lure, when they flow by our doors, to distant enterprise and adventure, and, by a natural impulse, the dwellers on their banks will at length accompany their currents to the lowlands of the globe, or explore at their invitation the interior of continents. Something will have gone out of us as a people if we ever let the remaining wilderness be destroyed, if we permit the last virgin forests to be turned into comic books and plastic cigarette cases; if we drive the few remaining members of the wild species into zoos or to extinction; if we pollute the last clear air and dirty the last clean streams and push our paved roads through the last of the silence, so that never again will Americans be free in their own country from the noise, the exhausts, the stinks of human and automotive waste. And so that never again can we have the chance to see ourselves single, separate, vertical and individual in the world, part of the environment of trees and rocks and soil, brother to the other animals, part of the natural world and competent to belong in it.